So I've been thinking, would it be possible to offer the ATP promos here on the forum like in the past? I know that they are offered on social media, which is great, but it lessens the chances of the die hard Animal fans that check in on the boards here to try out some awesome new products. You know if you ever need an honest and very detailed review that I will give you. Red Velvet - First of all what is red velvet? A real Red Velvet cake is made with cocoa and buttermilk and butter. It is very tender and moist. It has cream cheese frosting . For the most part Red Velvet will be colored with red food coloring and have hints of cocoa and cream cheese. I have tried a few other red velvets on the market (MTS and Rule 1). While both are good flavors Animal Whey has always treated me right. Shake: 6oz Almond Milk + 1 Scoop Red Velvet: The cocoa taste is present, and there are minor hints of cream cheese. This is something non-detected in MTS and Rule 1 is the slight aftertaste of cream cheese, which combines the true element of a red velvet product. 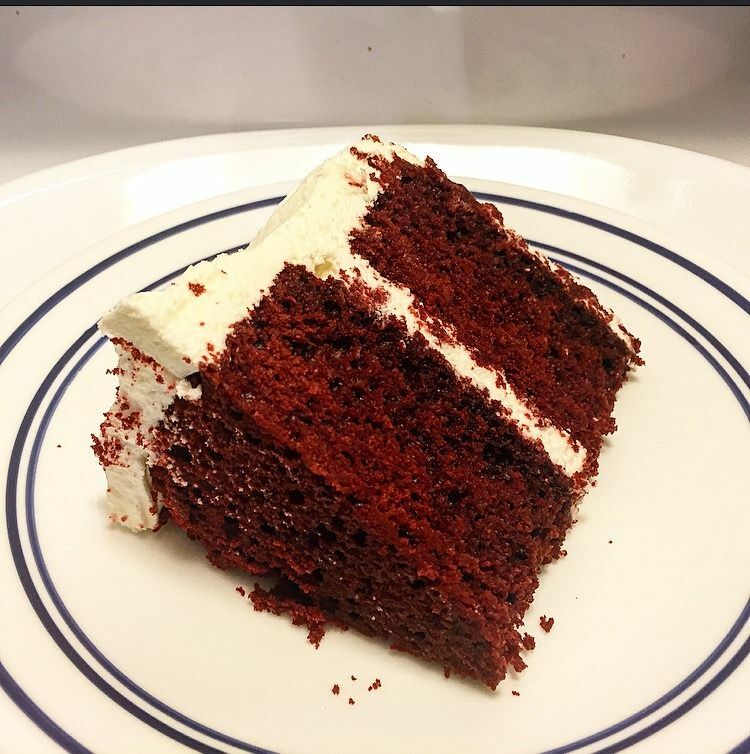 While it is very small you still get a glimpse that completes the red velvet experience. While the cocoa may be dominant in this flavor I would have to say this resembles close to the OG Red Velvet from Iforce which was my all time favorite red velvet flavor. Well-done Universal. Sludge: Very similar to a shake. For me whenever I mix protein powder in greek yogurt it tends to amplify the flavor. And in this scenario it helped enhance the slight cream cheese aftertaste and less cocoa. Making this a more balanced red velvet flavor. Could be because of the greek yogurt and texture, but I found this to be what I got out of it mixed in 6oz of greek yogurt. Mixes very easy and tastes great. Baking: While the flavor is taken away when baking because of all the elements involved in recipes there is still a hint during the baked goods. I made some pancakes and also cupcakes with the red velvet whey. The best part is my recipe does not change much between both recipes. Just baked in a different pan or prepared a different way to make sure it did not alter the taste that much. The frosting on both was simply SF/FF Pudding mix and Greek yogurt to make a cream cheese/cheesecake like frosting. This really hit the spot with the red velvet whey. For Red Velvet I used this product in baking (as seen in the recipes) and also mixed in yogurt. My simple go to Mixability is with 6oz of yogurt and 1 scoop of whey protein. For Shakes I do 6oz of Almond milk/Water and 1 scoop of whey. No clumps and mixes very fine. 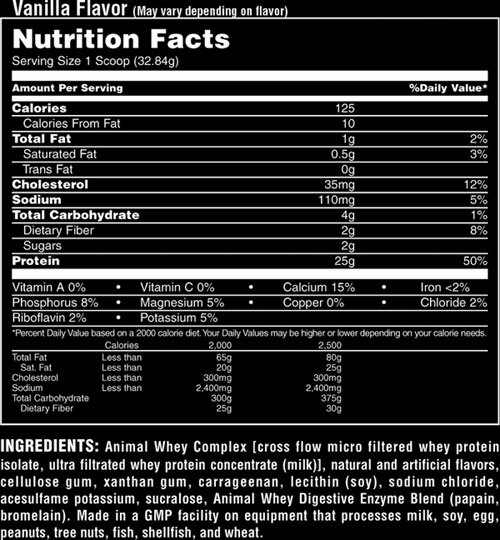 Animal Whey is light and never has Mixability issues. Animal Whey uses a blend of WPC and WPI which are two of the most commonly used forms of protein on the market. They provide natural and artificial flavors in their product, which provide a clean tasting product. Some people may be turned down by the hydrogenated Vegetable Oil (as some stay away from anything hydrogenated in general). Cellulose and Xanthan will help enhance the thickness of the flavor in the formula, and Animal Whey also includes a digestive blend (which I really enjoy) to help those who may suffer from any lactose problems or just an overall digestion aid, which never hurts. I also enjoy this is flavored with Sucralose instead of aspartame. The amount is identical to most protein powders on the market with around 10$/lb or raw materials to make up protein. With that said the overall caloric makeup (being around 120 calories) is a good amount and on the lower side than some out there. Not to mention for how easily this mixes up, and how it tastes this is a very quality protein powder. Animal Runs a LOT of sales for 25% off, 20% off, and always 10% coupon codes on multiple websites. You can get this for much cheaper then the outright cost of one tub, or they even throw in sample tubs with each order. Honestly, I kinda thought that was the reason for the forum members only section? On the flip side...they’d end up with the same 5 dudes reviewing all the new stuff. That´s the perfect answer right there. You know the loyal ones from the newbies with the join date and post count. If you suddenly have a bunch of people applying to a promo with 1-10 posts or recently joining it may make you raise an eye about how much loyalty they have to the boards or this forum. I agree you can tell the new from the tried and true but till have to look at Marketing and the use of social media as well. It open the door for new folks to learn about the brand and that the company actually values opinions even from folks who normally don't use the brand. The forum does still get some perks just not everything. I think the corp is doing a great job with spreading the word and giving everyone a chance to be apart of new products as they roll out. Like the new stuff with Evan, he has a lot of fans that follow him that may not follow Animal or Universal so that opens some doors... again its a catch 22 looking from both sides. but understood. Im sure more forum promos will pop up for us though. Worst comes to worst. I wait until the arnold and try the new stuff. You know I won't be missing the cage. That said, they could also promote products through social media and direct people to sign up on here to apply for the promos - but that’s assuming they want to increase site and forum traffic over their FB/IG pages. I’m sure there’s a reasoning behind all the moves they make. For sure. Will see you there!!! Like I said yes they can do that. BUT That poster will only post ONCE or twice ever just for the free promo and never engage in anything outside of that. Go onto any big forum --> BB.com for example. There is a LARGE amount of posters who only post JUST in the company promo and no where else to try and win free stuff, just to leave a 1-2 line review that has 0 merit to the company. Which is pretty crappy but real life. I agree with all of you. However Im sure even with social media promos there are people that just enter to win it, and don't really have a high interest in the company or the product. But that is probably unavoidable. So maybe if the promo went live on social media, and then post an opportunity over here to win? That'd be cool! I remember when Agent O came out exclusive to the forum. Lots of people got to test it, including myself, with great feedback by all. "Bar tasted great, love the natural ingredients"
"I like the makeup and taste of the bar"
"I like the bar I would pick them up"
When consumers read stuff like that how can you really make a decision based off such a broad and weak review? That is what boils my blood. If a company takes the time to do you a favor, the consumers should take the time to review the product for their effort. To be honest I’ve won my share of Animal products. I’ve beta tested the new Stak (a personal favorite of mine). I’ve gotten a free shirt or two over the years. I’ve been to ABCs and pulled a plane with the Chicago crew a few times. I’m not really miffed that there’s not a lot here on the FORVM anymore. I will say that when I order something from Animal and I find a sweet sticker or something tossed into the box I feel like I won something LOL. I wear the gear, carry my Animal gym bag and drink from my Animal shakers and when that odd guy asks if I’m sponsored by Animal, I straight up tell them no, but they take care of me.
. I wear the gear, carry my Animal gym bag and drink from my Animal shakers and when that odd guy asks if I’m sponsored by Animal, I straight up tell them no, but they take care of me. I have all the LE Shirts from the Olympia and Arnold from the last 6 years. I have a drawer of just Animal Gear. It is the best on the market.